CyberCANOEs (Cyber-enabled Collaboration Analysis Navigation & Observation Environments) are environments that allow groups of users to collaborate over large amounts of data using a shared tiled display wall. CyberCANOEs are driven by a software system called SAGE2– the Scalable Amplified Group Environment, that is co-developed by the Laboratory for Advanced Visualization & Applications, and the Electronic Visualization Laboratory. The new CyberCANOE comes with 30 Megapixels of resolution and will be used for meetings and classes conducted by the Hawaii Data Science Institute. 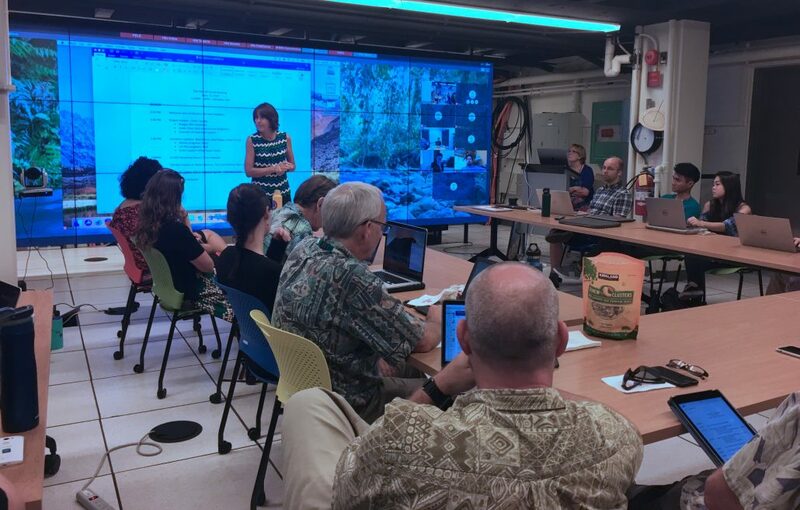 Pictured is the CyberCANOE used in ICS’ Data Visualization class as well as an All-Hands-Meeting of Hawaiʻi’s National Science Foundation EPSCoR project called Ike Wai. Funding for the CyberCANOE comes from a Major Research Infrastructure grant (1530873) from the National Science Foundation.